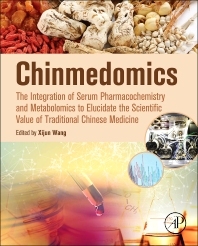 Chinmedomics: The Integration of Serum Pharmacochemistry and Metabolomics to Elucidate the Scientific Value of Traditional Chinese Medicine uses new experimental techniques and research to open doors in drug discovery and development related to traditional Chinese medicine (TCM). This book features a unique approach that combines chemometric analysis with metabolomics studies to illuminate significant changes that have occurred in syndrome states while simultaneously analyzing the efficacy of chemical ingredients in herbal medicines. Chapters provide cutting-edge information on traditional medicine, analytical technology, natural products, metabolomics, bioinformatics and their applications. This book provides a valuable resource for pharmacologists, pharmaceutical scientists, medicinal plant researchers, pharmacognosists and chemists working with TCM and highlights ways to further research and advances in this area in the future. Xijun Wang, PhD, is a Professor of Pharmacology of Traditional Chinese Medicine (TCM) and Vice President at Heilongjiang University of Chinese Medicine in China. Dr. Wang has published more than 150 papers in peer-reviewed journals, received the National Science and Technology Progress Award and National Technological Invention Award and holds 20 patents. His research focuses on serum Pharmacochemistry of Traditional Chinese Medicines. By integrating metabolomics with serum Pharmacochemistry of TCM Dr. Wang has developed and established the theory and research methods of Chinmedomics, whereby the clinical efficacy of TCM formulae can be measured and analyzed.